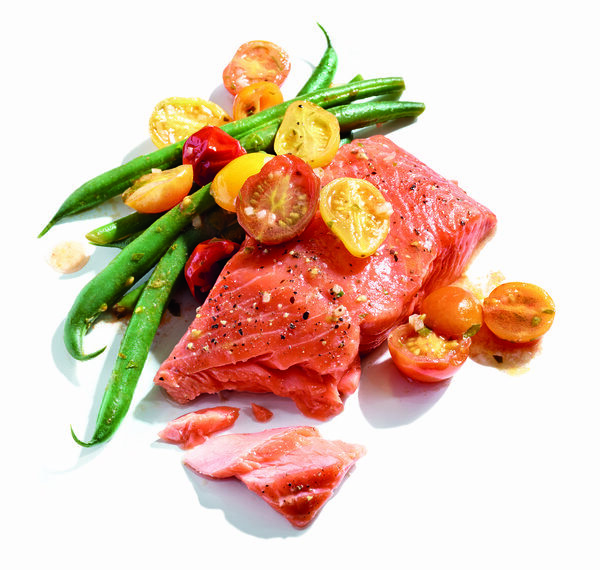 Slow roasting salmon gives the fish a rich, elegant flavor and makes it harder to overcook. Vibrant veggies in a tangy champagne vinegar dressing complete this weeknight standby. But the best thing about this gluten-free roasted salmon recipe is the resulting texture you'll get form the salmon--cooked yet soft and fancy-restaurant-like! Preheat the oven to 275°F. Place the salmon fillets in a baking dish, skin side down, so the fillets are not touching. Season the fillets with salt and pepper, pour 2 tablespoons of the oil over the fish, add 2 tablespoons of water to the dish, and bake until the fillets are still bright in color and appear medium-rare and slightly undercooked when gently prodded, about 15 minutes. Remove from the oven. Meanwhile, bring a pot of salted water to a boil, add the green beans, and cook until crisp-tender, 3 to 4 minutes. Drain. In a small bowl, mix together the remaining 2 tablespoons oil, the vinegar, shallot, tomatoes, and 1⁄2 teaspoon salt until well combined. In a small skillet, simmer the tomato mixture and the green beans for 2 minutes. Stir in the parsley and remove from the heat. MORE: See all the issues of GFF Magazine–where you’ll find hundreds of delicious, doable gluten-free recipes.